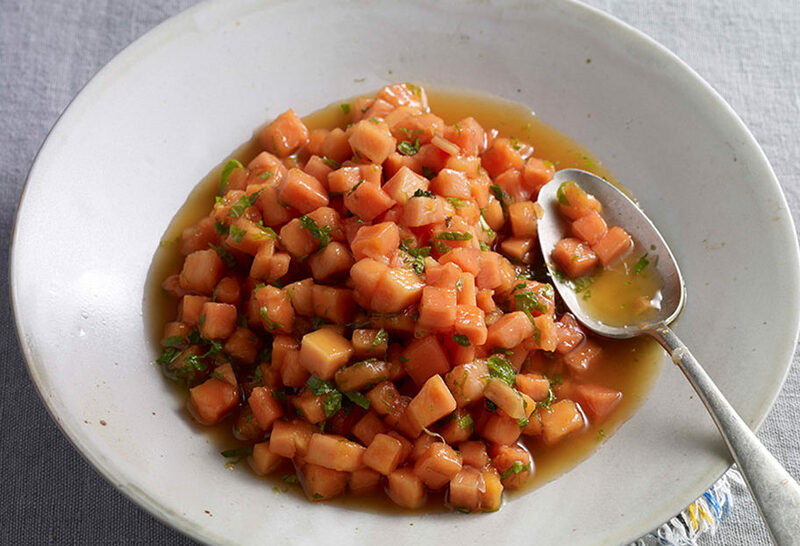 In a large mixing bowl, combine diced papaya, lime zest, lime juice, and agave syrup, or other sweetener, and toss well. Sprinkle on finely chopped fresh mint to garnish. Serve with the pound cake or on its own. This papaya looks yummy & refreshing. Love your show on PBS. It’s current & I appreciate that. Love your IG account. You make me crave tacos. Lol. We’ve had tacos twice this week already. Xoxo. Thank you for your wonderful recipes. Thank YOU Anita for tuning in and following me on Insta! Looks incredible! This triple lime pound cake & papaya relish will be dessert at my next enchilada night. Can’t wait for my family & friends to try. Thank you for all the simple & delicious recipes. Thank you!! Let me know what everyone thinks! Pati, I am excited to try the tuna minilla casserole and the triple lime pound cake. My five year old son and I love watching your show, you make it seem so easy to prepare these meals. Gracias por promover la comida mexicana en una manera tan divertida y refrescante! I loved the papaya topping you made for the pound cake, my favorite tropical fruit! Thank you Florcita! I am so glad you and your son enjoy watching my show, I hope you really enjoy eating the recipes too! It is SOOOOOOO good, I hope you like it as much as I do. I first saw Pati on THE CHEW and started watching her WONDERFUL and ENTERTAINING program. Love the inter-action with her three boys and Pati’s visiting with her family in Mexico City. She makes her recipes so easy and delicious sounding. Can’t wait to try them all!! Thank you for your great program!